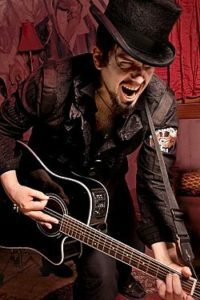 An internationally touring musician, Aurelio Voltaire is at the forefront of the Gothic, Steampunk and Dark Cabaret genres headlining some of the biggest horror, sci-fi and comic book conventions as well as Gothic and Steampunk festivals for nearly two decades. He is often described as a modern-day renaissance man: a singer / performer, creator of comic books, animation and toys. His music can best be described as a collection of murder ballads, tongue-in-cheek exercises in the macabre, with just enough bawdy songs about Star Trek and Star Wars to keep a convention audience rolling in the aisles. Many know him for his songs “Brains!” and “Land of the Dead” from the Cartoon Network show “The Grim Adventures of Billy And Mandy”.